Gambian leader Yahya Jammeh said Saturday he would step down to keep peace in his country after 22 years in power, following last-chance talks with west African leaders before a military intervention. Jammeh spent hours with Guinea and Mauritania’s presidents on Friday in Banjul, where agreement was reached that he would hand power to Adama Barrow, the declared winner of elections last month. 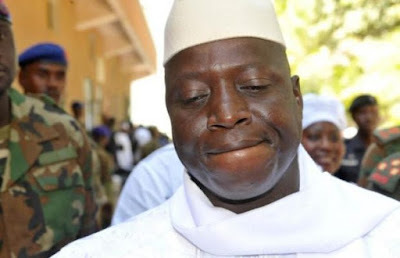 “I have decided today in good conscience to relinquish the mantle of leadership of this great nation with infinite gratitude to all Gambians,” Jammeh said in a statement broadcast on state television. The leader declared his decision to leave office — after weeks of stalling through threats and legal action — was his alone, despite immense pressure from the international community. However, agreement was not reached on where he would spend his life after his presidency. “My decision today was not dictated by anything else than the supreme interest of you the Gambian people and our dear country,” Jammeh said in his speech, thanking Gambians for their support. “At a time when we are witnessing trouble and fears in other parts of Africa and the world the peace and security of the Gambia is our collective heritage which we must jealously guard and defend,” he added.